Here is the first installment of responses to the "machine writing" questionnaire, at The Capilano Review. Perhaps, I have wondered too, how writing with ones hands might bring me closer to what I call “idiolect,” a term Robert Kocik uses to describe the poems in my book The Hole. Could this actually be a more accurate term than “lyric” or “expressive,” which have often been used to distinguish poetic writing that is not reliant on collage, assemblage, constraint, procedure, algorithm, or appropriation? I associate idiolect too with language that is both radically particular and eccentric, originating with rhythms and cadences and peculiarities of a singular writing practice, while also touching something that partakes of a commonplace of contemporary language use (vernacular, idiom, dialect). In this way, it may be similar to a “nation language” (Kamau Braithwaite) or a “minor literature” (Deleuze/Guattari). Kocik also distinguishes idiolect by its evocation of the “first-person-plural”; the way one may invoke collective subjects through an “I” that is neither entirely an extension of the singular or the multiple, but an expression of their simultaneous and mutual articulation. 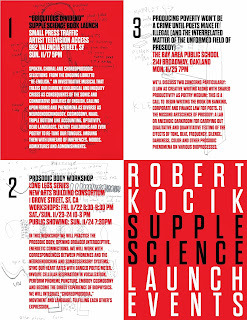 SUPPLE SCIENCE: a Robert Kocik Primer launch! 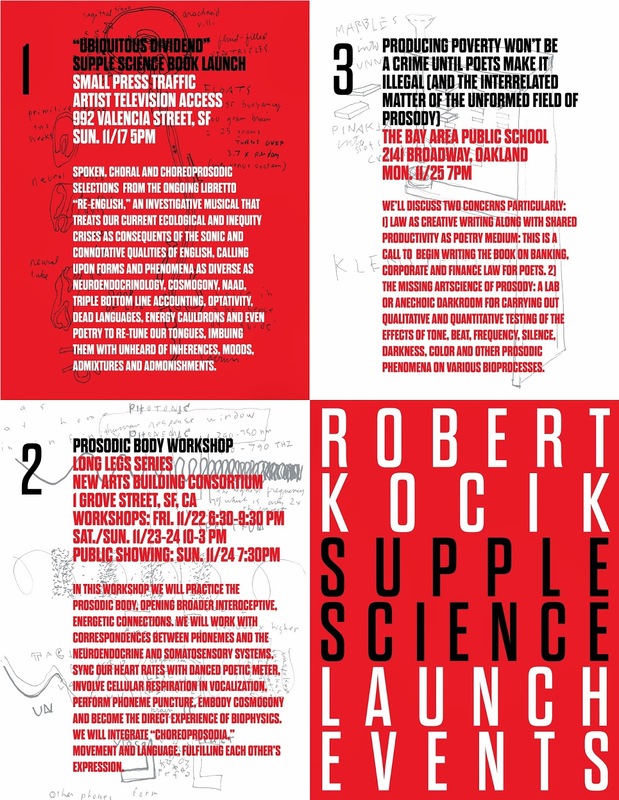 Thom Donovan and myself are incredibly excited to announce that our first monograph under the sign of ON: Contemporary Practice, Robert Kocik's book of collected essays, Supple Science, will hit the streets on Sunday, November 17th, and there are three ways to help us celebrate! Spoken, choral and choreoprosodic selections from the ongoing libretto "Re-English," an investigative musical that treats our current ecological and inequity crises as consequents of the sonic and connotative qualities of english, calling upon forms and phenomena as diverse as neuroendocrinology, cosmogony, naad, triple bottom line accounting, optativity, dead languages, energy cauldrons, and even poetry to re-tune our tongues, imbuing them with unheard of inherences, moods, admixtures and admonishments. In this workshop we will practice the Prosodic Body, opening broader interoceptive, energetic connections. We will work with correspondences between phonemes and the neuroendocrine and somatosensory systems, sync our heart rates with danced poetic meter, involve cellular respiration in vocalization, perform phoneme puncture, embody cosmogony and become the direct experience of biophysics. We will integrate “choreoprosodia,” movement and language, fulfilling each other's expression. "PRODUCING POVERTY WON’T BE A CRIME UNTIL POETS MAKE IT ILLEGAL (AND THE INTERRELATED MATTER OF THE UNFORMED FIELD OF PROSODY)"
We'll discuss two concerns particularly: 1) law as creative writing along with shared productivity as poetry medium: This is a call to begin writing the book on banking, corporate and finance law for poets. 2) the missing artscience of prosody: a lab or anechoic darkroom for carrying out qualitative and quantitative testing of the effects of tone, beat, frequency, silence, darkness, color and other prosodic phenomena on various bioprocesses.